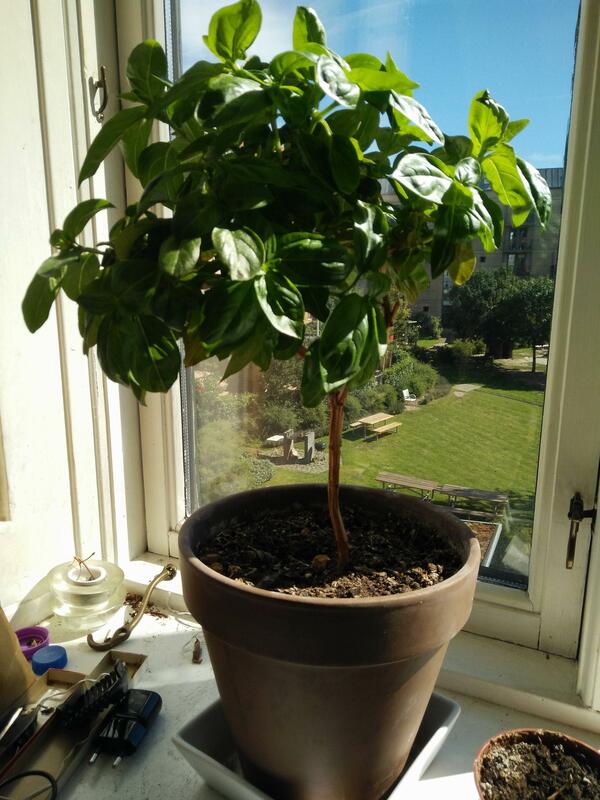 I have a 5 year old basil plant growning in my window. Since I don't know much about gardning it has been a small hobby of mine to prune it and keep it alive. My idea was to create some kind of bonsai basil. Since the 5 year old plant seams to be a bit out of controle, because of bad trimming and pruning, I have made some clones where I tried to be a bit harder when pruning. One of these clones are now about 2 years old. My question is, can I bonsai this plant? And does anyone have any tips or experience doing this? 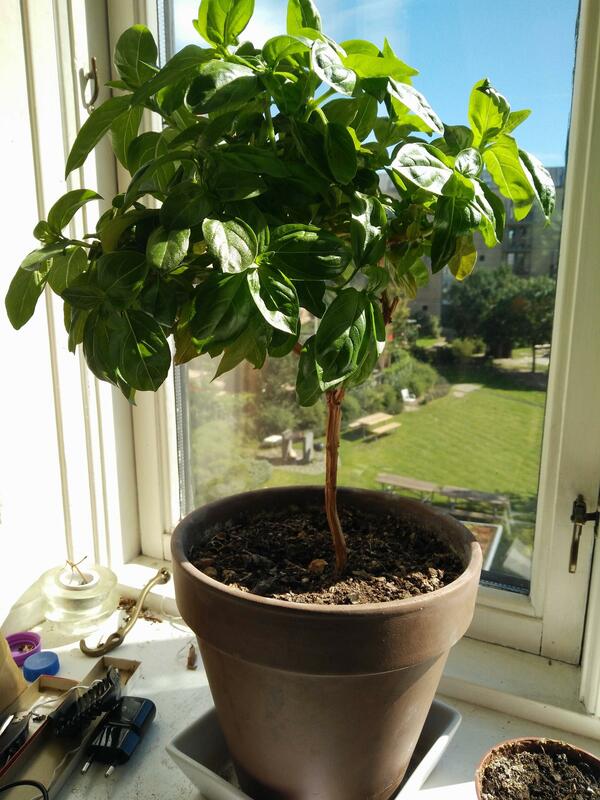 As you can see I have already tried to shape it like a small tree, but my fear is that over some years I won't be able to keep it like this, since the plant is constantly growing. So eventually it might end up looking like my 5 year old basil, which has grown too tall with way too many long and empty stems. Bonsai means a tree in a pot and, therefore, presumes a woody perennial. Remarkable, what you've done with basil. Since you've done this, you likely can 'bonsai it' by applying some basic principles. Every plant grows, so there must be a technique to keep the canopy of foliage more or less constant. This means developing ramification: as your view moves from the trunk, one branch becomes two, those two become four, and etc. As the plant grows it extends from the tips and enlarges the canopy. With ramification, segments can be removed from time to time, so that the canopy stays the same size (on average) over time. Of course, ramification can be by threes or fours, but this often leads to unattractive, knobby nodes and an extremely dense canopy. An extremely dense canopy means no light gets to the interior and, therefore, there will be no leaves inside. So, when you cut back, it will create a 'hole' where there is no foliage. On the other hand, if the canopy is thinned, light can get inside and you can develop short replacement branches before you cut back branches segments that have gotten too long.As long as light gets to the interior, pruning (cutting back) should release latent buds, making new shoots and new foliage closer to the trunk. With woody plants, stems can be wired (temporarily wrapped with wire) to shape them and to position foliage where you want it to make an pleasing image. This is very difficult to do with herbaceous stems, so you likely will only be able to use the 'clip and grow' technique to create 'movement' in the stems (as opposed to a static, straight stems). Aside from vines, a stem thickens most rapidly by letting it extend uninhibited with all the foliage it can support. Then it is cut back 'hard' (to a fraction of its length) and the let to grow again, directing it by removing buds/shoot going in the 'wrong' directions. This fat 'stub' won't thicken much until the new growth nears the same thickness, at which point you cut it back similarly and start the process over to eventually create a moving stem whose thickness tapers much more quickly and like the scale of your creation. The last thing I can think of for your technique tool box is figuring out how to best create ramification. There is, of course, the standard of simply decapitating a branch. With Japanese maples, for example, it is best to keep two leaves. With satsuki azaleas and boxwoods, on the other hand, it is better to keep just the terminal leaves and remove all the leaves between them and the trunk - many of the axillary buds will release into new shoots. And, of course, there is complete defoliation - removing all the leaves by cutting through their petioles, individually, and removing the apical terminal. This might also be done by cutting back to remove all the leaves in one snip. You will need to experiment to see how this works out. Since branches are largely autonomous, you can try one treatment on one branch and another on another branch to answer this question in short order (frankly, I would have a hard time not defoliating and eating the trimmings!). Basil as bonsai - WOW! There is an abundance of videos showing this techniques being applied to trees as well as blogs and web sites of which www.bonsai4me.com is one dependable resource. But, you are bravely going where man has not gone before, so you won't find anything directly about basil bonsai. Not the answer you're looking for? Browse other questions tagged houseplants bonsai basil or ask your own question. How can I grow an in-ground 'bonsai' oak tree? How do I grow a basil plant tall? Why are the leaves of my basil yellowing and falling off? How can I restore foliage in a Chinese Elm bonsai?